8,758 nm, and 92 hours to fly for my Stinson. Indeed, that is far too great a distance to fly in my humble and old Big Red. However, arriving in Adelaide, South Australia in a day or two, I could not object nor complain no matter how long it might take. Australia has become my second home. Unfortunately, we get there not near enough and can’t seem to stay long enough to really satisfy our craving for the Australian culture, climate, landscape, and perhaps even some of the family. In the course of the past 14 years that my wife and I have known or been married, we have only traveled back to her homeland four times. For a simple mid-western boy, I never imagined I would travel there to begin with, nor really want to call it home. But time and technology has brought the other side of the world much closer. You can now fly non-stop from Dallas, TX to Melbourne, Australia, the single longest direct flight in nautical miles of any airline route today. It takes an average 15.5 hours flight time, and let me tell you, that’s an immensely long amount of time strapped into a seat of a 747. Then there’s the layover in Sydney where they re-fuel for 45 minutes. Odd, really, landing in Sydney, getting off the plane and being rerouted back to the boarding area. You’re there, in Australia, just feet from the open air, but not really allowed to leave and your journey isn’t quite complete. Then you get back on that plane, back to the seat that you’ve slept in, farted in; the closed and nasty air of the cabin, and the stench of the feral passengers around you who, like you, haven’t bathed in nearly a day – some two or three. Bad breath and drool abounds, but you’re in Australia, and that’s all that really matters at this point. From Melbourne, my wife and I now venture onto the domestic terminal and catch an early morning flight to Adelaide. One more flight, one more leg, but its morning in Oz and despite your eyes burning from lack of sleep, pounding headache, and offensive body odor, you can’t wait to get to South Australia and feel freedom with the change of air, beautiful sky, and a landscape that evokes adventure and hardy spirit. So upon arriving, we head straight to the rental car counter and beg and plead to get our car. Freedom awaits. Family is near. We scramble to the car, luggage in tow, load the car and hit the road. Our visits to the great land of Oz are filled with emotional journeys for both of us, me perhaps on the level of great exploration and wonder, and my wife for the memories and the family. My wife’s family history dates back quite a long way in the hills of Adelaide. I can attest for a fact that she has many skeletons buried amongst the sheep pastures and large gum trees for I can venture to say we visited nearly every forgotten cemetary south of Lobethal. But family isn’t what this article is about. It’s truly about aviation. Australia has a great aviation history, all of which I am poorly educated in. They have the Royal Flying Doctors, and when you think that Australia is a country nearly the same size as the continental USA, there are great amounts of unpopulated lands that were probably unreachable were it not for aviation. But along the coastline, population thrives and airfields abound. In our hangar here in Ohio, we have a sectional chart of Adelaide airspace. Within that chart is a small field called Aldinga. At this location, General Aviation is in its highest and greatest form. A lovely setting near the Adelaide coast, home to beautifully maintained aircraft young and old. 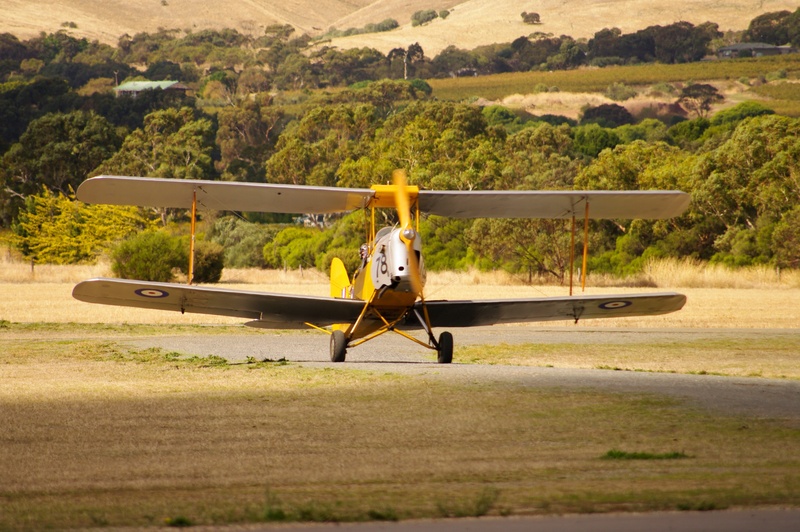 Check out www.adelaidebiplanes.com.au and you’ll see some fantastic photos and probably like me, sit and dream of a visit and a flight with these caring and friendly Aussies. 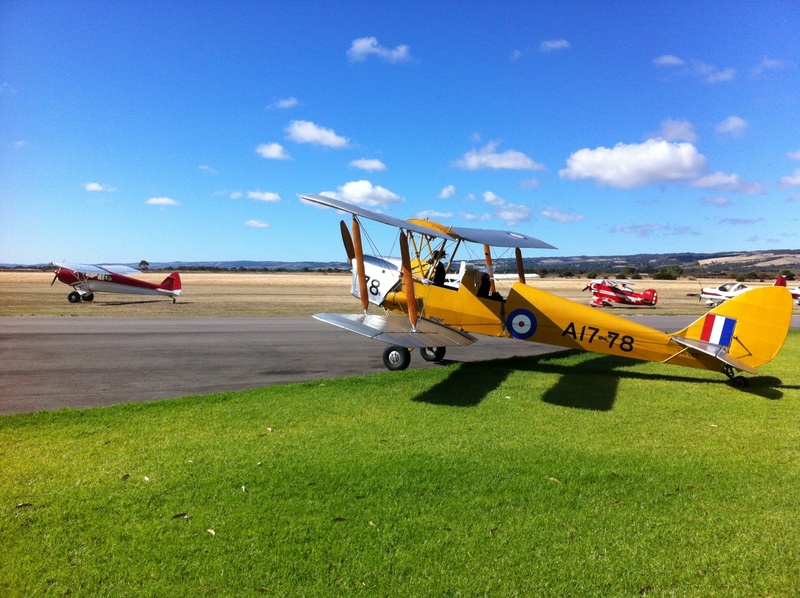 I had the pleasure of emptying my wallet to fly in their Tiger Moth. Though only buying a straight scenic flight, knowing I was a pilot and plane owner, I was allowed to take the controls as we climbed to 1,500 AGL over the shoreline. The Tiger Moth is a wonderful plane to fly, very light on the controls, if not “twitchy” in handling the elevator. Flying straight and level was somewhat of a challenge and I think I offended the PIC behind me since we kept undulating up and down like a gentle roller coaster in the kiddy park. But I didn’t much care, I was quite happy just to sore around the low lying fair weather clouds, wind in my hair, smell of oil filling my nose. The coast line is amazingly beautiful, and this time of year it appeared of rolling hills of gold, the large white gum trees dotting the landscape and catching the sun like pillars. After the flight I felt that all I wanted to do was sit on the veranda off the main office, sip some amazing Australian coffee, perhaps have another slice of apricot cake, and just watch the local aviation experience throughout the remainder of the day. If they had asked me to wash the plane, I would have. Pump fuel, you bet. Help load other tourist into cramped cockpits, just show me to the shoe horn and I’ll wedge them in. Whatever it would take to just bask in the beauty of the operation, the land, and the people. We keep watch now, here in Ohio, over the Facebook page for this wonderful company. I love seeing their posts, the people the take on scenic flights, and the new pilots they train. I have yet to see anyone without a smile. Those that have been and left, sitting all around the world, my odds are in favor that each and every one of them has at a time sat in a quiet room, closed their eyes and looked back to their memory of Adelaide. They can see themselves in the cockpit of the Waco or the Tiger Moth. They hear the sound of the engines, and the smell of exhaust. They smell the air, and the cakes from the kitchen and of, yes, of course the coffee – flat white for me. Just 8,758 nm away from here. It would be warm there now. We could all being wearing shorts and t-shirts and slathering on sun screen. I’ve been on a few ultra-long flights, and they’re a special circle of hell, even for someone that loves flying. Great description of some of the joy that awaits the end of such a long journey.